Hannah Saunders and Richie Bent from Dublin first met on holidays in Portugal when they were just 16 years old. 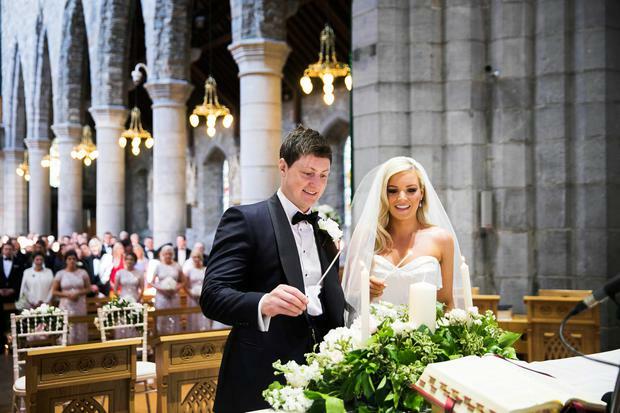 They got engaged in December 2016, when Richie got down on one knee on a chilly Grafton Street while Fairytale of New York played in the background. By chance, a friend happened to be walking by at the exact moment Hannah said 'yes', and captured the entire proposal for the couple to add to their memory box after. Although they've been living together in London for the last five years, Hannah and Richie always knew they'd return home to Ireland for a big wedding. "I wanted a stylish and elegant wedding," says Hannah, "boho and rustic is not for me!" The theme of the wedding was "Tale as old as time" as Hannah's favourite movie is Beauty and the Beast ("my mum has called me Miss Potts since I was very little!") 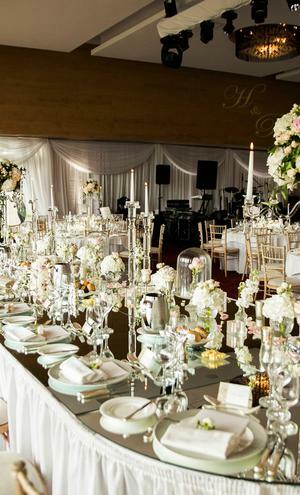 It was put in place from the get-go with the couple sending out "Be our guest" cards as Save the Dates, and continuing the theme throughout the day with details like rose dome centrepieces on the tables at The Europe Hotel in Killarney. Their photos are by Jenny McCarthy, assisted by Elaine McGrath. 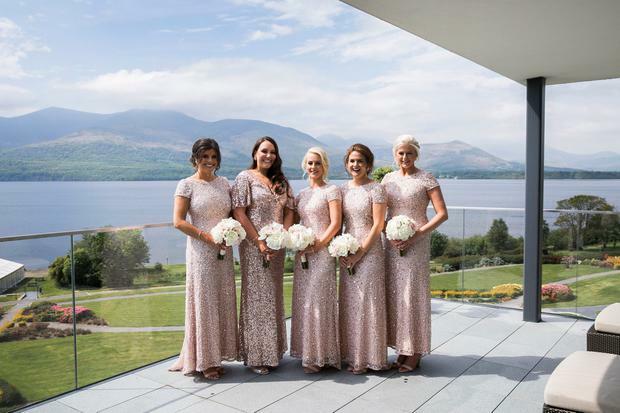 If you're currently finding it difficult to pin down the perfect gúna for your own big day, you might take solace in the fact that Hannah tried on a total of 76 dresses before finding the one for her (her advice to others now is to "decide early the style the best suits your body, then stick with that and go with your gut")! 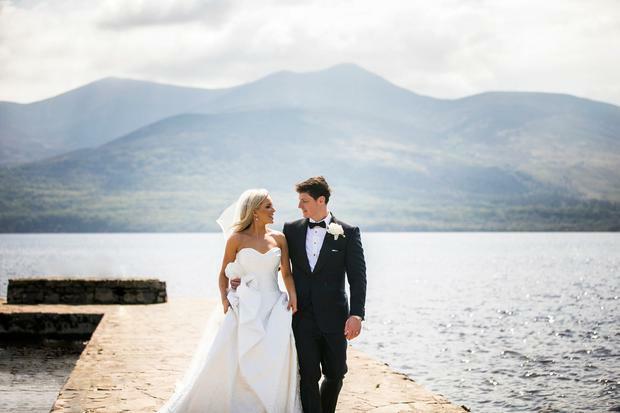 She eventually found her beautiful Peter Langner gown in Browns Bride in London (but highlights Alice May Bridal in Dublin and Halfpenny London as two of her favourite boutiques). "My God can this man make dresses," says Hannah. "I happened to meet him when I was in the store and after getting a sense for the dresses I was pulling off the hangers he knew what dress I should wear. Although I didn't like it on the hanger, the second I put it on I fell madly in love with it." Hannah completed her look on the day with a stunning veil by Kate Halfpenny - which featured 50 hand sown petals trickling down the back to create a waterfall effect - and stunning sparkly Chiara Ferraghni shoes. Richie wore a tailor made tuxedo in midnight blue from Gieves and Hawkes on Saville Row. "I have never experienced customer service like it, and the personal shopping area is the finest I have ever seen," said Hannah. "I have never seen Richie look as handsome!" He accessorised his suit with paten loafers from Russel and Bromley. 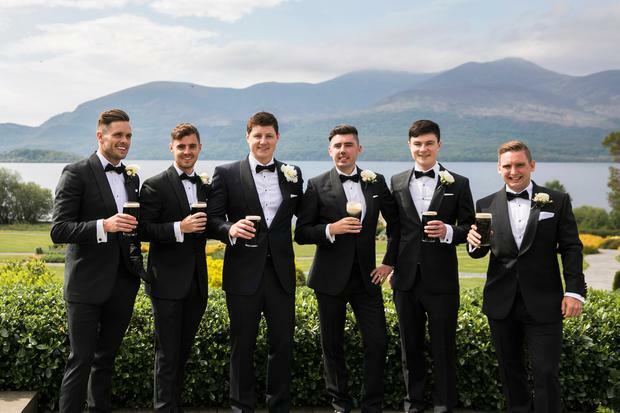 The groomsmen wore tuxes from Charles Tyrwhitt London. "I enjoyed every single moment of planning the wedding!" says Hannah, "in fact since the wedding I've been asked to help in planning a few more! "It's the project you will be most passionate about in your whole life," she adds, "and seeing it all come together after 18 months of planning made me feel so proud. I made a promise to myself to never get stressed, being able to have a wedding of any standard is the greatest blessing we were so lucky to be able to have a wedding to this standard. I worked with many different suppliers to help in pulling everything together, but one personal touch was organising about 30 photo frames of all shapes and sizes to fill with photos from both our parents weddings, funny baby photos and our engagement pictures, it was a really nice touch. 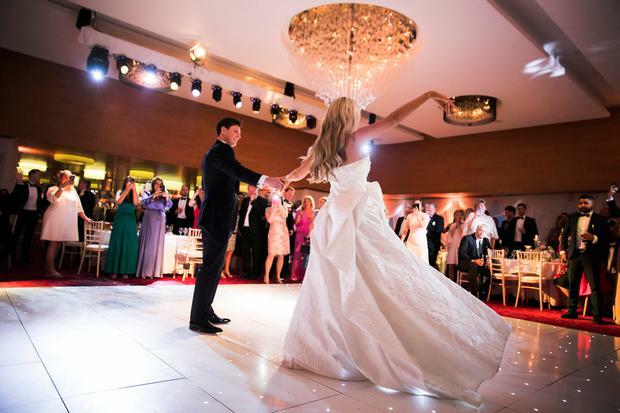 We also had the most amazing fireworks display to surprise guests after the first dance, it was a seriously pinch me moment." 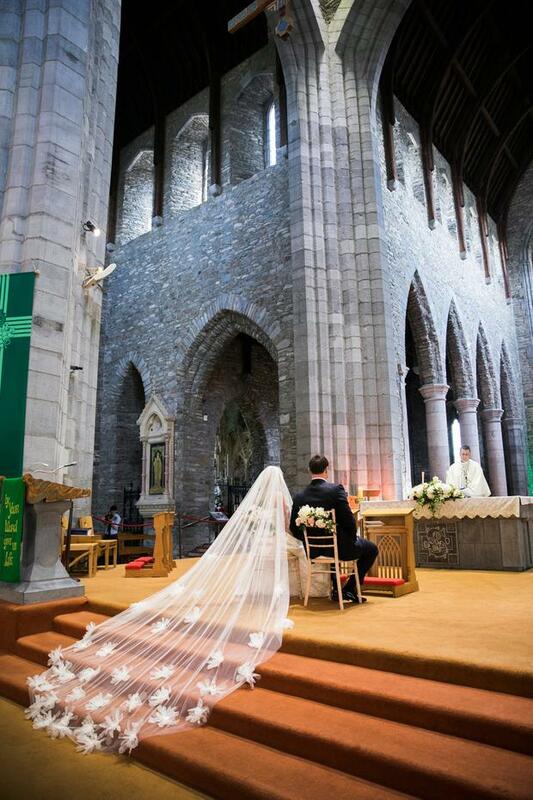 Hannah and Richie said 'I do' in St Mary's Cathedral, Killarney, in a ceremony presided over by Fr. Jim Lenihan. "It was sentimental without being cheesy, and informative without being preachy, it really moved us both," says Hannah, adding that after, it was especially lovely to hear how much the younger guests enjoyed the ceremony. One of the highlights for both Hannah and Richie was the 'Blessing of the Parents', which Hannah explained; "both our parents came up to the altar and we stood side by side holding hands, it was really special and for Richie and I as it made us realise how lucky we are to have had both sets of parents to witness our marriage something we often take for granted." For their music, they had a combination of a string trio ('Here comes the Trio'), an organist and singers Simon Morgan and Laura Wright who flew in from the UK; "Their version of the Prayer was the best I've ever heard and I think most of our guests will agree." 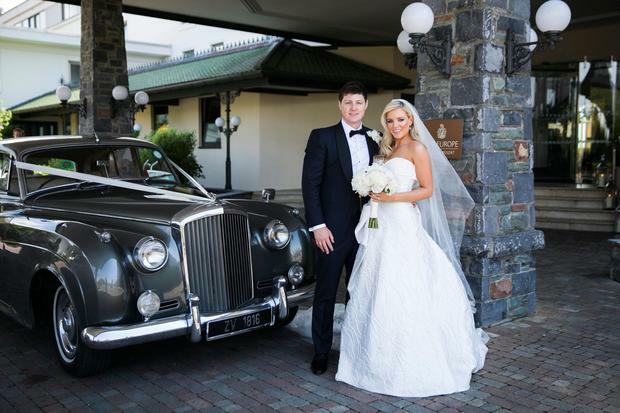 The couple held their reception in The Europe Hotel in Killarney, a hotel has long been a feature in Hannah's family having spent every Easter break there since she before she was even born. "I like to think I'm pretty well traveled but it is my favourite hotel on earth for so many reasons," she says, citing the view and the staff as two of the biggest draws. 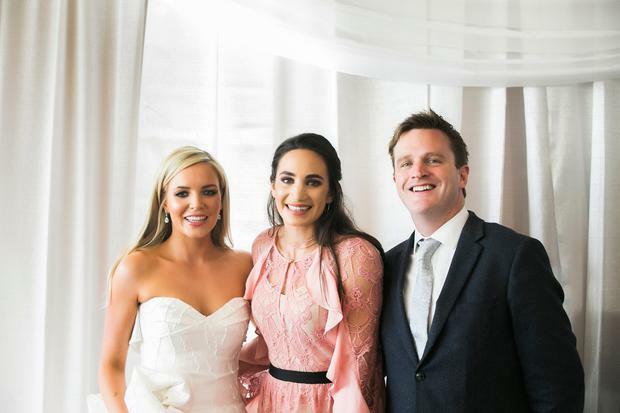 "We've built a long great relationship with the General Manager Michael Brennan who is the most wonderful man, and their events coordinator Leeann Keating who became my lifeline in the lead up to the wedding. Richie has been coming here with my family too for the last five or six years and so it is now a very special place for him too, and as he's golf obsessed it's a prime location! We had our rehearsal drinks in John Reidy's pub in Killarney town the night before - it's hands down the best pub in Ireland and they gave us a mighty send off!" "Ah there were so many," says Hannah of her favourite moments from the day. 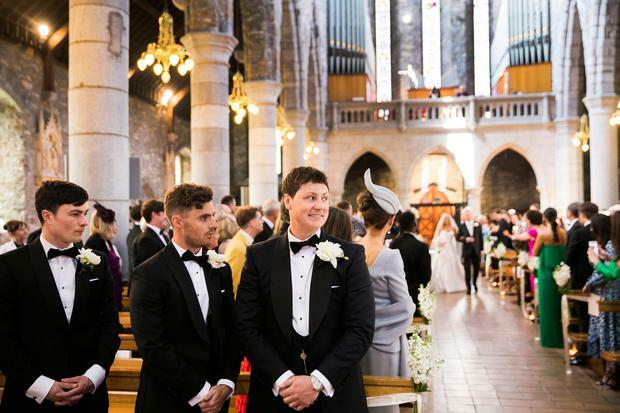 "Richard he loved the ceremony, between the sheer drama and beauty of the cathedral in Killarney and the music in the church which gave most of our guests goosebumps! He also loved our entrance to the ballroom we came in to Paradise by Coldplay and it was just the happiest moment!" 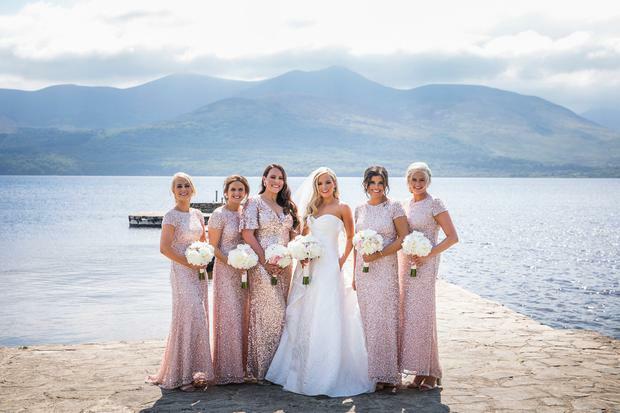 "For me, I loved seeing my Dad for the first time it's a very special moment, getting ready with my bridesmaids was so much fun... seeing Richie at the top of the altar... and my number one moment was our first dance, I loved every second of it! We danced to 'Still falling for you' by Ellie Goulding, and as we'd had a few cheeky lessons we could really give it socks, for me it was such a Cinderella moment." 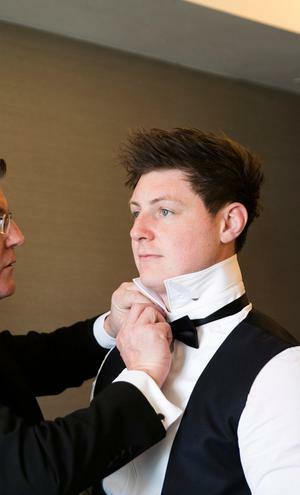 Having been very hands on with the planning of the day, Hannah has plenty of no-nonsense advice for bride and grooms-to-be. If you're getting stressed with planning she says; "Just remember how lucky you are to have met someone you want to spend the rest of your life with that's all that matters." And on the budget: "Agree on one and work towards that, you'll find yourself getting tempted to through so much extra in out of panic especially at the end, don't do it! If you plan it well you will pull off your wedding day without any nasty surprise bills coming in after. You can make magical things happen no matter what your budget is - get creative." For those planning a big wedding, Hannah says to remember that the day is about you as a couple; "If you have a 30 minute conversation with every guest you will not see each other. 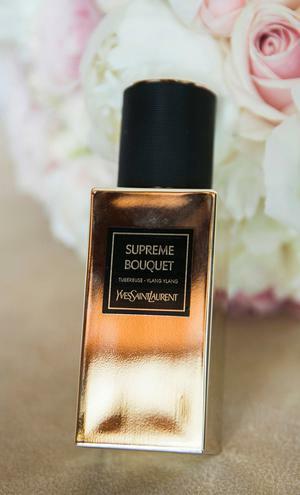 Your guests are having so much fun and they understand that as much as they are loved. Looking at photos I love how Richie was beside me for pretty much the entire day, that's how it should be." Hannah and Richie jetted off to sunny Santorini on honeymoon - a spot that's long been on their bucket list. "We both decided we didn't want to spend more than four hours on a flight until we had a glass of rose in our hand sitting on a sunny balcony somewhere.! We really want to make the most of this time together making memories for the rest of our lives."